Daily Illuminator: More Muskogee! More Mayhem! August 5, 2013: More Muskogee! More Mayhem! Have you wanted to visit the Muskogee Fairgrounds and Family Emporium, but haven't yet endangered your household by bringing them down for a day of fun? 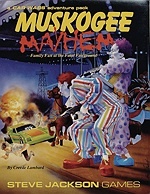 Then we've got news you can use -- in the form of Car Wars - Muskogee Mayhem! Greatly expanding on Car Wars Expansion Set 9 - Muskogee Fairground & Family Emporium, this supplement adds more background info, events, and scenarios; it also includes full-color counters, perfect for using with the included gargantuan four 21" × 32" maps that form the Fairgrounds' racetrack. (And if you're a proud owner of Expansion Set 9, check out the upgrade pack that will add the new information to the maps you already have.) Start your engines, Car Wars fans; you're ready for total Mayhem!